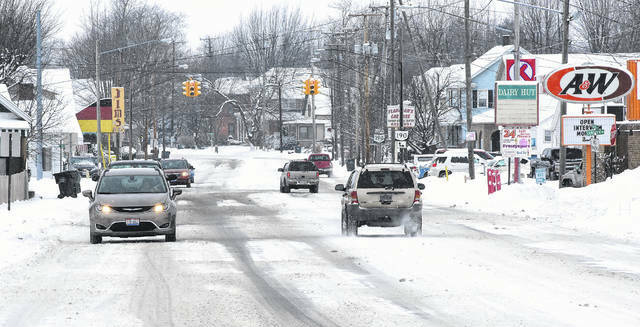 Traffic travels on Fifth Street in Delphos on Friday afternoon. DELPHOS — The portion of Lincoln Highway traversing Delphos may be seeing some major updates by 2021 in order to address speeding concerns as well as make the roadway safer for those using alternative transportation. Shane Coleman, Delphos safety services director, said the $3.6 million project kicked off when the Ohio Department of Transportation told Delphos of its intention to repave all the state routes through the city. One ODOT feasibility study later, the administration now has plans in hand that would eliminate one lane of traffic in the Fifth Street corridor, add bike lanes and expand the width of sidewalks along the two-mile route. Coleman gave three reasons for the proposed change. First is a high preponderance of angle crashes. Due to motorists getting stuck behind turning vehicles and aggressively switching lanes, angle crashes within the corridor are higher than the state average. The design switched to a three-lane route (one lane for both ways, with a central turn lane) in order to eliminate the scenario entirely. ODOT’s feasibility report on the project identified 80 crashes on the route in a three-year time period, from 2014 to 2016, with more than a third categorized as angle crashes. Two of the 80 crashes also involved bicyclists. The second reason is concerns of safety of those using alternative modes of transportation, including pedestrians. A survey sent out to Delphos schools showed that many parents in the village expressed safety concerns for their children when they cross intersections on Fifth Street. Eliminating a lane makes it safer to cross the road and slows down traffic. And for the third reason, Delphos has a unique position among other small towns in that it currently sits on the intersection of two long-distance hiking trails — the Buckeye Trail and North Country Trail — and what is slated to become a federal bike path stretching from Canton to the Indiana line. Making “America’s Friendliest City” friendlier to bicyclists and pedestrians could help those using the trails to better access Delphos businesses. While Coleman said he has heard some enthusiasm for the project, other Delphos residents have responded negatively. A recent editorial by resident Dennis Wieging identified some issues he had with the project — including the addition of bike lanes, potential difficulties for businesses on the route and lack of resident input. Traffic counts by ODOT identified the route as serving 5,500 to 6,000 vehicles per day. According to the feasibility study, the reduction of a lane of traffic is not expected to impact travel time along the two-mile stretch. As for the project cost, the majority of project funds, roughly $2.1 million, have already been identified from state grants, and Coleman said he is pursuing further opportunities to reduce the City of Delphos’s financial burden. Coleman and engineers attached to the project are scheduled to present the current status of the project to Delphos City Council at 7 p.m. Feb. 4.